Have you ever had a shot where the object ball was hanging in the pocket and when you shot it the cue ball followed it in? Maybe someone told you to aim low on the cue ball, and maybe you did, but without actually appreciating what that meant, you did not achieve the desired outcome. Why didn’t the cue ball stop or draw back? Why did it follow the object ball right into the pocket? 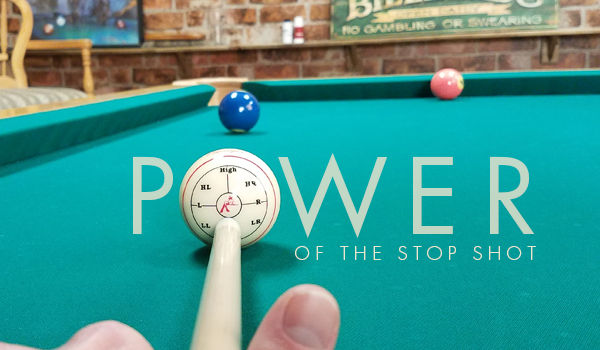 The fact is, if I walked into just about any bar or tavern with a pool table and asked, “How do I shoot a stop shot?” I could expect an assortment of answers. Some may say, “Aim at the center of the cue ball,” or, “Hit it hard.” Some may even say, “Aim low.” Technically, all these answers are correct, but in order to consistently execute a perfect stop shot from any distance at any speed, you must first understand what causes the cue ball to stop. 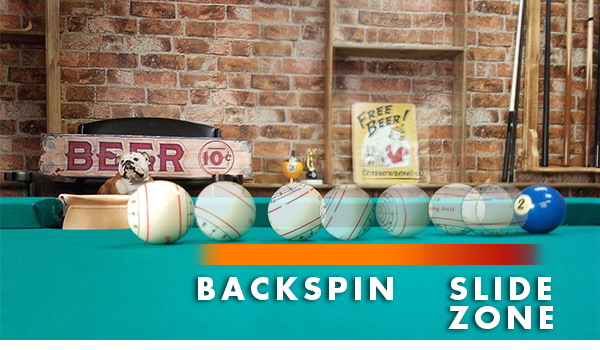 Hitting low on the Cue Ball creates backspin that turns into a slide after a certain distance. Hitting the Object ball head on while the cue ball is sliding is a Stop Shot. By definition, a stop shot is when the cue ball is sliding at the point of contact with the object ball. When it’s lined up straight at the object ball, 100% of the energy from the cue ball is transferred into the object ball and the cue ball has nothing to do but stop. Executing a precise stop shot requires the perfect speed and tip position on the cue ball. You may have stopped the cue ball before but the only way to be consistent with your accuracy is by repetition and understanding the physics involved. In Part 1 of this 2-part series, you’ll use the stop shot to develop the beginnings of playing position. Before you can predict the path of the cue ball, you must first be able to execute the stop shot. All abilities to control whitey begin with understanding how to stop it. Once you’re able to consistently execute the stop shot from any distance and speed, you will always know which ‘line’ the cue ball will travel on. I promise! Along with using the stop shot to predict the cue ball’s path, it’s also an excellent way to calibrate your stroke. For instance, if you were an archer instead of a pool player and every arrow consistently propelled to the left of the bulls eye but you swore you were aiming dead center, it may be safe to assume that you either have a mechanical or sighting flaw. 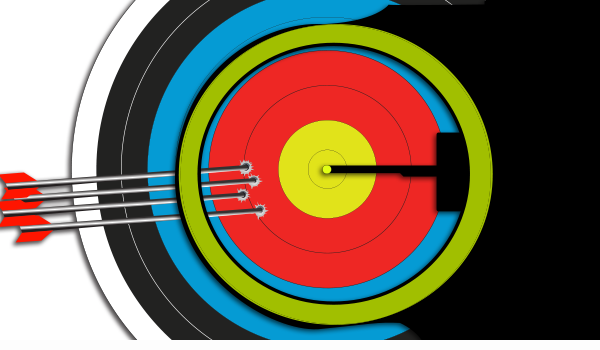 Either way, what appears to be the center to your eyes does not equate to the center of the bulls eye. If you’re consistently seeing results that are off. You’ll need to recalibrate your stroke to sync up your mechanics with your aiming. In pool, these sighting or stroking defects are not as obvious. Many times, if we’re playing a game, it’s possible to mishit a shot that will still go into the pocket when using good speed. As a beginner, you may be more concerned with pocketing the ball than with the physical properties of how it gets pocketed. Setting up and repeatedly shooting stop shots is one of the best ways to identify any sighting flaws or mechanical inconsistencies. If you aim at the very bottom of a measles cue ball and shoot it firmly to the center diamond, the length of the table, you would see that it backspins initially before it starts rolling forward. If you pay close attention, you’ll notice that somewhere in between the back spin and forward spin, the cue ball is actually sliding. 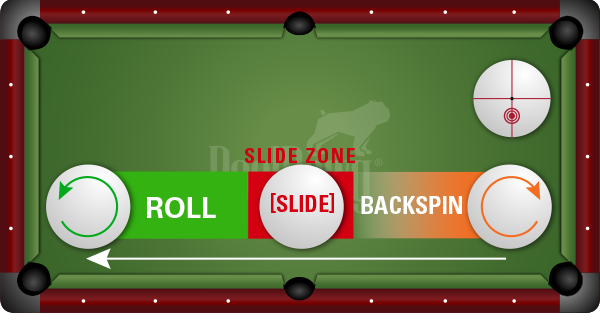 We’ll refer to this window as the “slide zone.” Where the slide zone occurs and for how long is determined by your speed and your tip position on the cue ball. The easiest way to remember this is: To achieve the same results, LOWER SPEED = LOWER TIP POSITION. Simply put, from now on, you will use your speed and your tip position to manipulate the slide zone to stop the cue ball. In the next lesson, you will apply what you’ve learned about the stop shot to predict the path of the cue ball, as we move into position play. Hit speed and contact position on the cue ball determine the slide zone. Now that you have a better understanding of how to execute the stop shot, let’s incorporate this into your practice regimen. Begin by shooting some short-distance stop shots straight into the side pocket. Once you’re able to stop at least three in a row, move on to the corner pocket series. This series is ideal on a 9-foot table but can be done on any sized table. Start with the object ball at position 1 and the cue ball at position A. Reset the balls after each attempt. Try to shoot a total of five successful stop shots at 1, 2, and 3 before moving the cue ball to position B. If you get to positions 4 and 5, that’s a bonus! This is a great drill to practice the stop shot. Incorporating this into your pre-match warm-up routine will also allow you to get a feel for the playing conditions on the table. ­­• Where is the object ball entering the pocket? You should be aiming for the exact point where brown meets green, the center of the pocket. • Is the cue ball stopping at the point of contact (not rolling forward or backward)? • Are you noticing any unwanted side spin on the cue ball after the point of contact? • If you notice the cue ball sliding horizontally to the left or the right, then you have not hit the object ball where you intended to make contact, dead center. If you cut the object ball to the left, the cue ball will move to the right and vice versa. Note: The Aramith Pro Cup 6 Red Dot TV Cue Ball or the Jim Rempe Training Ball are both great tools to help visually see if you are inadvertently adding any unnecessary spin. If you’re using the Rempe ball, you can easily check to see where you actually contacted the cue ball by the chalk mark left behind. Just be sure to set up the ball so that it’s lined up properly.